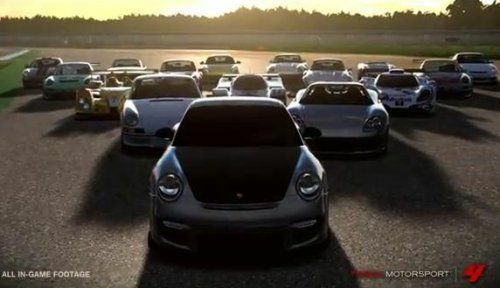 On Monday, TorqueNews was able to get ahold of the complete car list for the Forza Motorsport 4 Porsche Expansion Pack but now that I have purchased the package from the Xbox Live Marketplace (and on my console), we can run through everything included in the Porsche pack. The Forza Motorsport 4 Porsche Expansion Pack carries a price of 1,600 Microsoft points ($20 USD) but those who either purchased the Forza 4 Limited Collector’s Edition or the recent VIP Package can get the Porsche pack for just 1,200 points ($15). This is pretty expensive as car packs go but this is far more than your typical car pack with over 80 new races and 30 historic high performance Porsche models. First of all, the biggest addition as part of the FM4 Porsche Pack is the long list of Porsche models that were previously unavailable for Forza 4. Below is a complete list of the vehicles included in the Porsche Pack. Next, the Porsche Expansion Pack adds three new monthly Rivals events. The event titled ‘Giant Killer’ has everyone racing in the vintage Porsche 550 while ‘Love, Panamerican Style’ pits everyone head to head in the 4-door Panamera supercar. Finally, ‘Autocrossed Porsche’ is an autocross event open to various Porsche models. As part of the monthly event section, we can expect these to leave the list at some point but having arrived to late in May, we would expect to see these run through June. In terms of permanent Rivals events, the Top Gear, Spec Laps, Open Time Attack and Drift Zone categories each get a new Porsche –specific event featuring various Porsche models. When combined with the monthly Rivals events, the Porsche Expansion Pack adds 7 new Rivals races. Finally, the Porsche Expansion Pack for Forza Motorsport 4 adds 20 new events with a total of 80 races. These new events appear on the far left side of the Event list in the FM4 career mode and while the majority of them are specific to Porsche models, there are a handful of new events that pit Porsche models against other automakers so these 80 new races are not just 80 new Porsche races. These races range from an F-Class shootout in the Porsche 550 with a limit of 200 to the Porsche Spyder Evo Passing Challenge with a class limit of R1 998. In total, the FM4 Porsche Expansion Pack adds 12 race cars, 17 production sports cars and 1 production sport utility vehicle along with 87 races – 84 of which are permanent. At 1,600 Microsoft points, it is the most expensive DLC package we have seen for Forza 4 but with so much content, it is a bargain. Figure that the average car pack costs 560 Microsoft points and includes 10 cars, maybe a couple monthly Rivals races and nothing else. Just based on that, the 30 new Porsche models in normal car packs would have cost 1,680 Microsoft points (560x3) so the Porsche Expansion Pack is technically less expensive than normal monthly car packs. That also means that all of those races added to the game are free of charge.